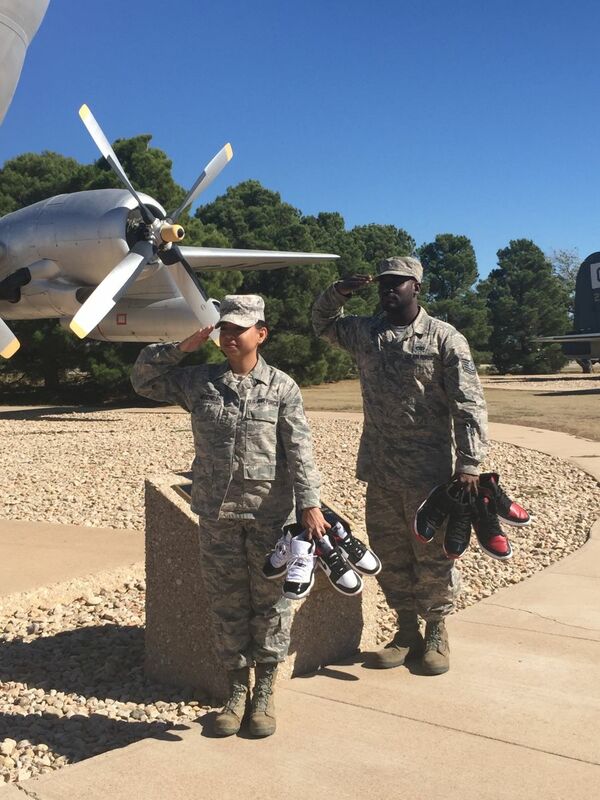 Sneakerheads in the armed services talk maintaining their habit while on duty. Sneaker collectors can take a lot for granted. We have the luxury of spending as much time as we like browsing blogs, discuss upcoming releases, and sharing our latest pickups. Thanks to members of the armed forces who dedicate themselves to serving our country, we can enjoy these privileges. But, what about those sneaker enthusiasts in the military? How do these men and women satisfy their sneaker habit while travelling, working, fighting, and going months without Internet access? 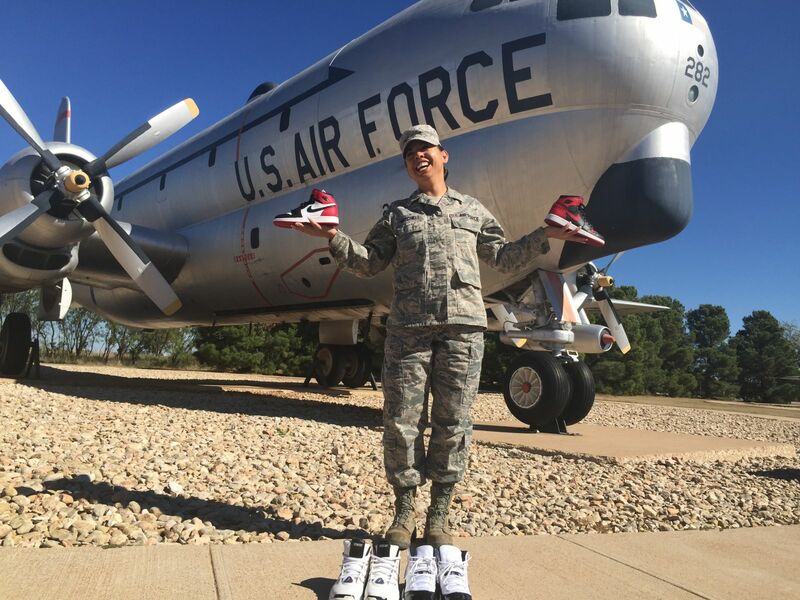 Here, Sole Collector talked to several military personnel, whose love of sneakers carries on, even when duty calls. How'd you first get into sneakers? Everett West, Technical Sergeant, U.S. Air Force : My best friend had every shoe growing up and I loved them, but my mom couldn’t afford them. So my love for shoes started from envy initially. 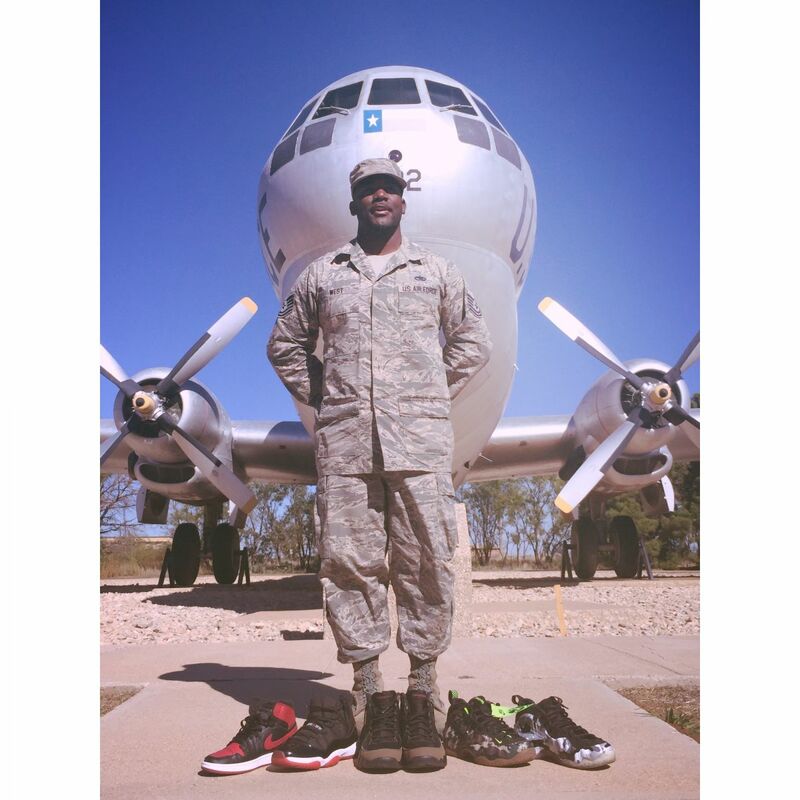 Terrance Scott, Seaman, U.S. Navy: I can honestly say I first got into sneakers when I got my first pair of shoes. The first pair of shoes my mother put on me was a pair of Air Jordan 2s in red and white. Here I am 27 years later, and I’m still buying shoes. James Dwyer, Petty Officer, U.S. Navy: Growing up in Chicago in the ‘80s I just wanted to be like Mike, and the sneakers were a part of that. Also hip-hop culture was an influence. Sneakers were a kind of status symbol to most people. High school seemed like a fashion show with everybody trying to be fresher than everyone else. I just thought they looked dope and tied my outfits together. Lynette Mitchell, Staff Sergeant, U.S. Air Force: Playing basketball when I was younger. It was one of the things that me and my dad shared, our love for the game. 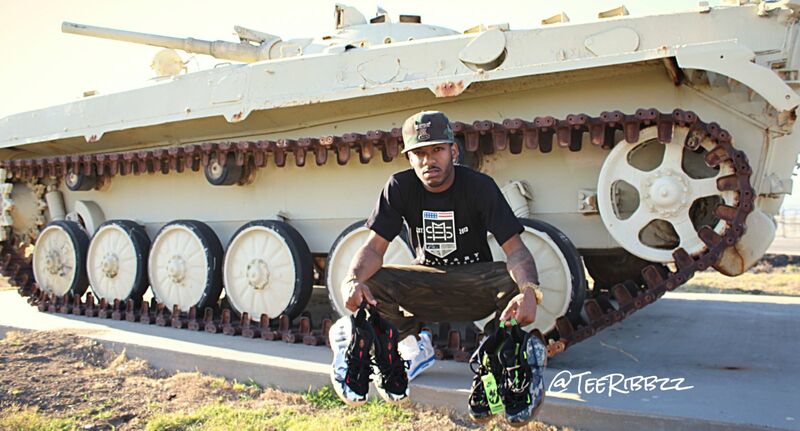 Does being in the military influence the way you approach sneaker collecting? EW: Being in the military broadened my shoe horizons. If I stayed in Baltimore I would probably only wear Nike Foamposites and Timberlands. TS: Being in the military gives you a whole different approach on collecting. We constantly relocate every two to four years, and with that, you have to worry about losing shoes along the way. Depending on where you’re stationed you might not even be able to get certain shoes. I can say Germany, Korea, and Japan have some of the best places to cop. JD: Yes and no. It doesn't change my desire for them, but it sometimes makes it more difficult to obtain pairs. However, if I want a pair badly enough I have the means to financially make it happen more comfortably. I'm fortunate to have a lot of the pairs I really want. LM: I think being in the military has helped me out. I know people all over the world that are willing to look out for me. Our military sneakerhead community is like a family. Are you able to follow what's happening in sneakers while you're deployed? EW: Each deployment I have been on has been vastly different, but I still keep up with shoes everyday to clear my mind and focus on something not so serious. TS: You can get shoes when deployed if you have good friends & great family members. My mother is retired Navy. She understands my struggle, so she and my wife both try to cop for me. I give them a list of the releases I want most. If I’m lucky they might even surprise me with something that isn’t on the list. JD: I serve aboard a submarine, so access to the outside world is completely nonexistent. Phone, Internet, etc. isn't an option. If I miss out I just miss out. JR: When I was deployed, we went on missions very often. Sometimes for two weeks at a time. I am infantry, so when we are on mission we aren’t behind a desk. It was very hard to follow releases. How do you buy new releases? EW: The local stores hold me down, but when the shoe doesn’t get released in this market, I use my Military sneakerheads family or try my luck on Nike.com. TS: There is a few different ways I go about it. My first option is to use sneaker groups via Facebook, like the one I created “Military Sneakerheads” aka “MSH”. It’s a great group because, there are people all over the world from Japan to the UK to both ends of the US we are literally worldwide. That gives you a wide range of people who may be willing to help. I run the group along with three other guys from other branches. JD: If I’m deployed, I have to wait until I return home and decide if I want to pay resale prices. While I'm home, if I have the day off work, I cop just like the next person. I do, however, pass on most #SadderDay activities. I like to sleep on my days off. When you’re on tour, how much opportunity is there to wear sneakers? EW: There are plenty of opportunities. As a matter of fact, the sneaker community while deployed is huge. People buy and trade all the time. JD: I'm not on the type of submarine that makes port calls, so non-military issue shoes are only for working out. JR: While deployed, the only sneakers I wore were Flynits, and that’s when I was at the gym. Other than that it was combat boots or my Nike slides. Really no opportunity to wear sneakers while deployed. Do you pack certain sneakers with you when you're deployed? EW: I always bring four or five pairs. Last deployment, I took Kobe 5s, Air Max ‘95s, Air Jordan 1s, Foamposites, and Supras. 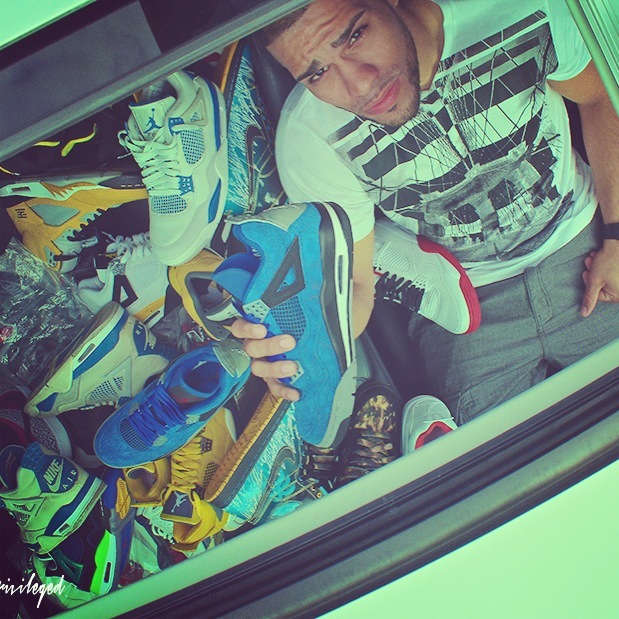 TS: I bring the kicks I can wear with everything that I brought on tour with me for the best color matching. I also bring kicks that I don’t mind if they come up missing. So no heat, but something that will def turn someone else’s head. I usually bring about four to five pairs if I can fit them in my seabag. JD: I usually only bring a couple of running shoes to work out in and wear around the sub. I don't want to destroy any of my favorite pairs in the engine room. For my upcoming deployment, I'm focused on comfort and ventilation, so the LunarGlide 6 and the Flex Run are the two pairs I'm bringing with me. LM: I had a nice little line up. I brought my canvas Air Jordan 1s, my Area 51 Nike LeBron 10s, and my Nubucks Air Jordan 12s. Then I got my graffiti Nike kobe 8s, meteorology KD 7s, and my Sport lebron 10s send out there. Any surprise sneaker come ups while stationed in remote places? EW: I was able to get KD IV Aunt Pearls last time I was out and Taxi Lebron 9s. I bought both online with slow Internet. TS: Yeah, I got the Kilroy 9s in Mississippi while I was in A-School. I also picked up tons of good shoes while I was in Italy- from the patent Air Jordan 1s to the low top Air Jordan chrome 6s and 8s. JR: Whenever I did have time, I would search for grails. I purchased two grails while deployed along with many other sneakers. One was the Hoop Pack Uptempo, and the other was the blue Laser IV sample. What are the challenges to being a sneakerhead in the military? EW: This is a military sneakerhead’s biggest fear. In 2008 while moving from Alaska I had 312 pairs of shoes stolen. Thank God for USAA and renters’ insurance. TS: Yes. I can say I lost about over 100 kicks. It hurts just thinking about it because some of those shoes are worth so much today. I probably won’t even get them again because of the resale prices. LM: I think the only challenge I’ve had to face was making new connections everywhere I go. When I get to a new duty location, my first stop is the local shoe stores to get to know the people working and make sure they know me too. What's your opinion on sneakers that have been released over the years to honor the military? EW: I’ve been in the military for 11 years. I appreciate all the military-themed shoes and the way we have been honored. Younger guys may not understand it right now, but we are a proud heritage of military members, as a matter of fact less than 1 percent of the nation serve, so when sneaker companies make shoes in our honor it reminds me someone still looks up to us. TS: I think it’s dope whenever they drop something to honor us and those who served. I try to always at least pick up something dealing with the military, or any shoes that have the stars and stripes that represents Old Glory. I can say I personally love how they did the camo foams. I thought that was cool and picked up both pairs. They’re def a part of the collection that I wouldn’t want to let go. JD: I always value the support of the armed forces. It would be dope to see pairs released to honor individual services though. If any brands need help with a collab, I'd be more than happy to help design something.